CONFRATERNITY OF PENITENTS BLOG -- Follow the Confraternity of Penitents, a Catholic Association of the Faithful for people who want to live at home a religious Rule of Life, originally given by Saint Francis of Assisi to the penitents of his time. We do not know the exact day on which Jesus was born. But let us say that it was December 25 over two thousand years ago. Let's imagine the Holy Family on that day. Nazareth. Mary is sweeping the house. Joseph is at work in the carpenter shop. She has prepared swaddling clothes for the baby very soon to be born. He has carved a cradle. They await each day with excitement and a little trepidation. A son whose birth is announced by an angel. Whatever will this child be? Do they have the grace and wisdom to parent him? That day a centurion rides into town. The emperor has declared a census. Everyone must leave at once for his ancestral home to be be counted. Mary and Joseph hear the news. Leave? Today? This is a great burden. Mary is about to give birth. They had their home ready to welcome the child. Now they must leave. Right now. Today. Of course, many other people are in the same situation, having to pack up and leave, now. Joseph stops working on the table he is making for a neighbor and begins to ready the donkey. Mary begins to pack. She wads up the swaddling clothes and puts them into a pouch. She finds changes of clothing for her and Joseph. This should not take too many days. But the baby could be born before they come back so she must be ready just in case. There is hustle and bustle, much hurried preparation. Mary and Joseph secure their house and leave. Joseph is heading to Bethlehem because he is of the house of David and Bethlehem is the city of David's birth. He imagines that the place could be crowded. He hopes they can find a place to stay. But there is no way to reserve a room--no cell phones, internet, carrier pigeons. 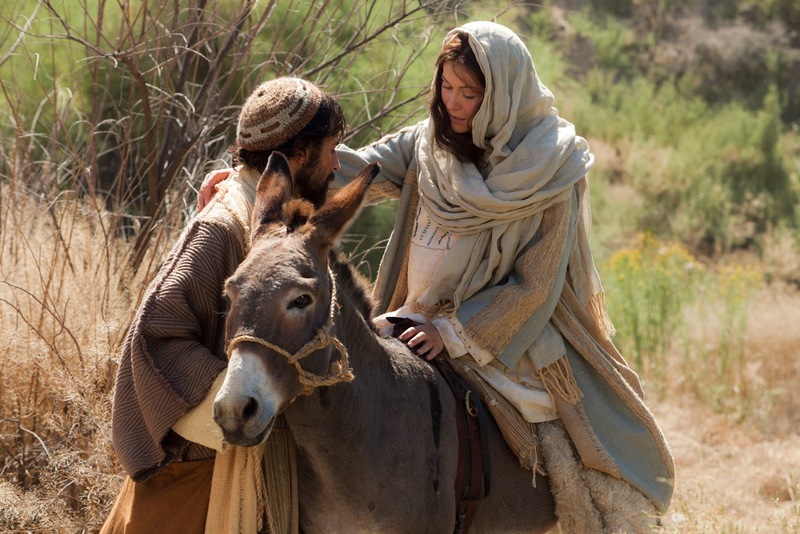 So the Holy Family goes out, a long walk on foot with a donkey, having no idea what lies ahead except that Joseph will register for the census and then they will return to Nazareth. December 23, over two thousand years ago. Why is this happening? Caesar Augustus has no idea that he is being an agent of God. Joseph is not thinking about the fact that Bethlehem means "house of bread." Mary has no inkling that Jesus will call Himself "the Bread of Life." Did Anna and Joachim go with Joseph and Mary or did they stay behind in Nazareth? Did Joseph and Mary bid them good bye, thinking they would see them within a few days or a week? Did anyone think that the root of Jesse was about to blossom again? The Holy Family had no thought that this baby would be born in a cave or that they would soon thereafter flee to Egypt, a country they never intended to visit. They had no idea that they would not return to Nazareth after their trek to Bethlehem. Anna and Joachim would never dream that they would not see their grandchild until he was seven years old. December 23, over 2000 years ago. The humility of God to be born an infant. The power of God to work out where and when. The wisdom of God to have the birth happen amid this confusing and unanticipated way. Where are you now, December 23 of this year? What lies ahead? You know not, but do you have to know since God does know? Can you draw up your trust today as did Mary and Joseph and go forward, without having your questions answered but in surrender to the will of God? Lord, give us the grace to do so. Permission is given to reproduce posts in this blog on any site or social media provided that the blog post is reproduced in full, all the links and images are maintained as given, and the following attribution is displayed with each post: "Reproduced with permission of the Confraternity of Penitents blog at cfpenitents.blogspot.com All Rights for Reproduction reserved. copyright Confraternity of Penitents. Please write to the Confraternity of Penitents at copenitents@yahoo.com if requesting reproduction of this piece. View Confraternity of Penitents website at www.penitents.org"
Click on image to go to home page of the Confraternity of Penitents. Our vision is to live the Rule of 1221 for penitents (lay people living in their own homes) as closely as possible to its original intent, as envisioned by St. Francis. 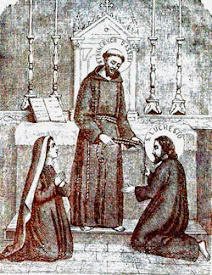 The image shows Saint Francis of Assisi accepting Blessed Luchessio of Poggibonsi, Italy, as the first penitent to live the Rule of 1221 while Luchessio's wife, Bonadonna, witnesses this. It is highly likely that she, too, became a penitent although she is not beatified or canonized. CFP Holy Angels Gift Shop - click on image to go to the Confraternity of Penitents Holy Angels Gift Shop, a religious gift shop with many Franciscan, San Damiano, and other items. Proceeds from the CFP Holy Angels Gift Shop supports the Confraternity of Penitents in its evangelization mission to encourage conversion to Christ worldwide. The Confraternity of Penitents is an international Catholic lay association of the faithful whose members live in their own homes a modern adaptation of the original rule given by St. Francis of Assisi to the penitents (those wishing to convert more deeply to God). The Confraternity is headquartered in Fort Wayne, IN, USA but has members throughout the USA and world wide. Consult our website www.penitents.org for information.